If you’re planning a move in DC, Northern Virginia, or Southern Maryland, you should hire a moving company Washington DC knows for thorough, professional service. Suburban Solutions has been operating in the DC area since 2009 and can help ease and expedite your transition to your new home. We’re a Washington DC moving company who serves clients’ needs in both local and long-distance moves and offers a range of other specialty services, including packing, moving, cleaning, and junk removal. Keep it local. Navigating the DC area is challenging enough; with moving trucks and valuables as part of the equation, it can be doubly so. Making sure you hire a moving company Washington DC is familiar with can make an enormous difference when it comes to your move going smoothly. Look for a licensed and insured company. It is absolutely crucial that the moving company you choose be licensed and insured. This speaks volumes about their legitimacy as a business, and, just as importantly, gives you a safety net in case anything goes wrong. Investigate the rate. Some moving companies advertise rates that fail to include services that are central to the move, or that you greatly need. When a company gives you an estimate, make sure it’s complete. Read reviews and get recommendations. With online reviews so widely available, it’s easy to find complaints, especially recurring ones about a certain company. Sorting through both negative and positive reviews helps you know whether you’ve made a good decision, as can talking to local friends and colleagues who have worked with a particular company. Listen to the movers’ questions and comments. What they say to you says a lot about their experience, training, and degree of professionalism. They should have plenty of questions that demonstrate their concern and care for your valuable possessions. Suburban Solutions is a moving company Washington DC customers can attest meets all of these parameters. We always do our utmost to give our clients excellent moving experiences by answering all questions as completely as possible, offering unparalleled attention to detail, and using our local knowledge to expedite the process. Give us a call to find out how we can serve you with your move. Suburban Solutions’ Washington DC branch is currently run by Michael Fabrikant and Brian Fitzgerald. They come ready to serve you with more than 14 years of combined professional experience. 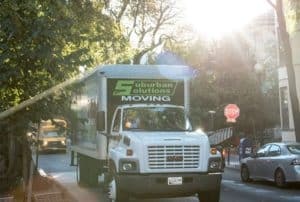 Packing, moving, cleaning, and junk removal are all part of the services they offer at Suburban Solutions’ DC location. Talk to us about your move! Suburban Solutions is the right choice when you’re ready for a seamless, efficient moving experience with a highly trained crew that will treat your belongings as carefully as if they were their own. We value every customer we work with and would love to consult with you. Contact Suburban Solutions for a quote and to start working with a moving company Washington DC highly recommends, today.